Storm Gareth may have been causing gale force winds and lashings of rain across Britain. 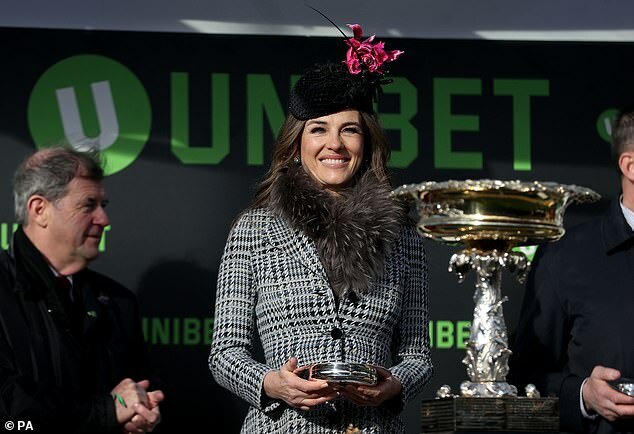 Yet Elizabeth Hurley still managed to look effortlessly elegant at the star-studded Champion Day of the 2019 Cheltenham Festival at Cheltenham Racecourse on Tuesday. 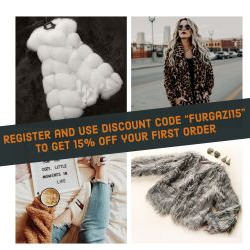 The former Countdown star, 53, wore a chic ensemble of a grey and baby blue tweed tailored coat with black velvet buttons, she accessorised it with a brown faux-fur collar. Elizabeth completed her look with a black velvet fascinator embellished with matching colour lace flowers and beads, adding a pop of colour a collection of pink flowers were attached on the left side. The Austin Powers actress styled her brunette locks into a voluminous curly blow-dried hairdo, she added a slick of glamorous make-up which included black eye-liner and pink lipgloss. 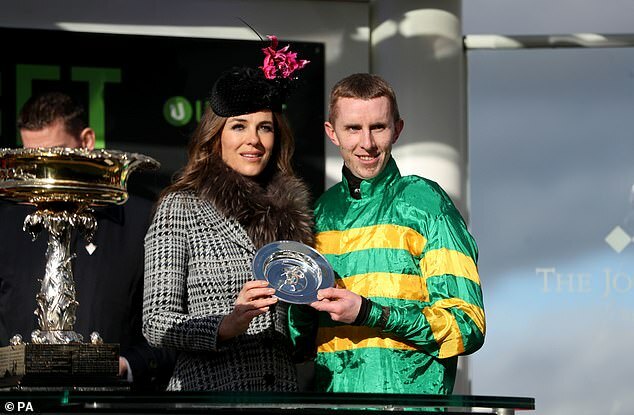 Elizabeth appeared in good spirits as she posed with Irish jockey Mark Walsh, who rode Espoir D’Allen who won the Unibet Champion Hurdle on Tuesday.